Taboola has raised $9 million in additional capital investment thanks to the strength of their video recommendation engine, the new round of funding brings the company’s total take to $15 million according to CEO and founder Adam Singolda. The company current serves recommended videos some of the best known online resources in the United States including Bloomberg, The New York Times, USA Today, CNN, Demand Media and Heart among others. 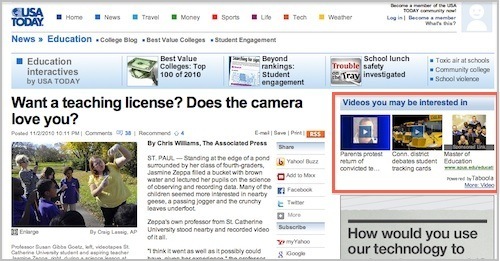 Taboola works by using semantic and behavioral algorithms to show site visitors the content they want to see based on each page they view on publishers websites. The video recommendation engine has been a popular choice in large part because Taboola allows publishers to control the content they want users to see, including the blacklisting of certain content and the promotion of other materials. The new round of funding was led by Crescent Point with an assist from Evergreen VC.